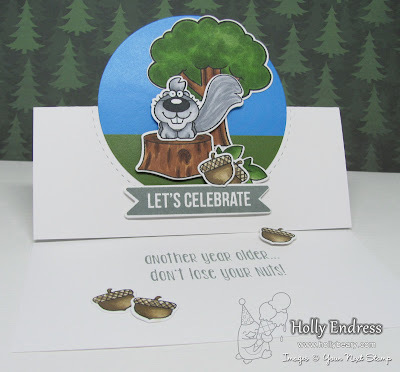 Hollybeary Creations : YNS Blog Hop!!! Who's ready for a Blog Hop? It's time for the YNS September Release Hop and we have lots of fun projects and a $25 GC for the Store up for grabs!! This is a great release perfect for all your Fall & Halloween projects! My first project uses the new So Corny set and coordinating dies. I created a fun background using some Pattern Paper from Doodlebug that I die cut with the Large Stitched Rectangle die. I added the panel to a White card base. Then I stamped the sentiment onto a strip of White and created a banner. I adhered the banner and a some made from additional papers along the edge with a mini stapler. Then I added a partial circle along the lower edge that I created with the Circle dies and the stitched Marks circles. I stamped the image and colored it in with Copics and used the coordinating dies to cut it out. I adhered it in the circle with some foam tape. For an extra pop of Black I added some Matte Black Gumdrops. My second card is a Flop card using the new Funny Forest Critters Crew and coordinating Dies. I'm also using some of the new Woodlands pattern paper for the background. I created a standard card base and then I die cut the Flip Circle die from the center. And adhered a circle of the pattern paper to the center. Then I added some stitching markers around the circle with the Stitched Circle Marks die. I stamped the images and colored them in with Copics and then I die cut them using the coordinating dies. I adhered them to the circle using some foam tape and liquid glue to create the scene. 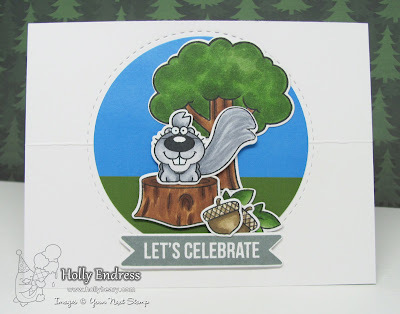 Then I stamped and die cut the "Let's Celebrate" banner form the Word Critters Gardening Birds set using some Grey ink. On the inside of the card I stamped the sentiment and I added some of the acorns. I added one with some Foam tape to hold up the flip portion of the card. Are you ready to Hop along for some fun projects? 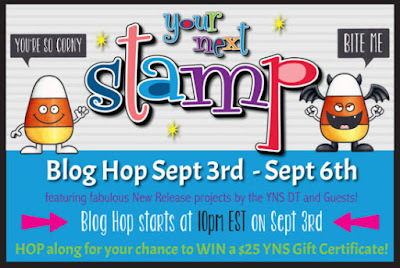 Be sure to leave comments along the way for your chance to win a $25 GC to the YNS Store.. Happy Hopping! Super cute cards! Love the cotton candy guy! Cute cards. Love the critter flip card. Cute cards! The little candy corn guy is so adorable! Love the candy corn and the animals. great cards. Cute, cute cards! "So Corny" is adorable! Holly! WOW!! Very very cute fun cards!! Love them both!! Thanks so much for sharing!! Awww such sweet cards. I just love the Funny Forest Critters. Hi Holly, Both cards are super cute! I’m really enjoying this new release. Love these cards! They're so much fun! Very sweet cards. Thanks for sharing them. I LOVE your Corny card!! Bhahh hahaha.. I can't stop laughing! Oh my goodness! These cards are so cute! 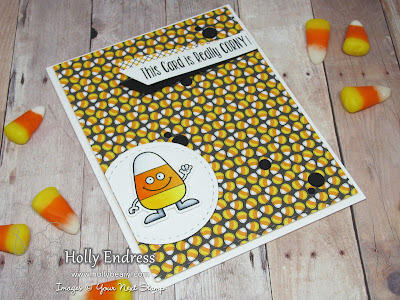 Love the sentiment on the candy corn card especially! Lovely cards! Love the colors! Both cards are adorable! The flop card is really fun! What a cute layout on the top card, and the bottom one is inspiring. I always forget about making easel cards and they are so fun!! Great projects!! the corny card is really cute! i like the flop card design, cute stamp sets! Great cards and I still love eating candy corn candy. Really like that Flip Circle die. Thank you for sharing your ideas and being a part of this new release blog hop giveaway. Fun cards! 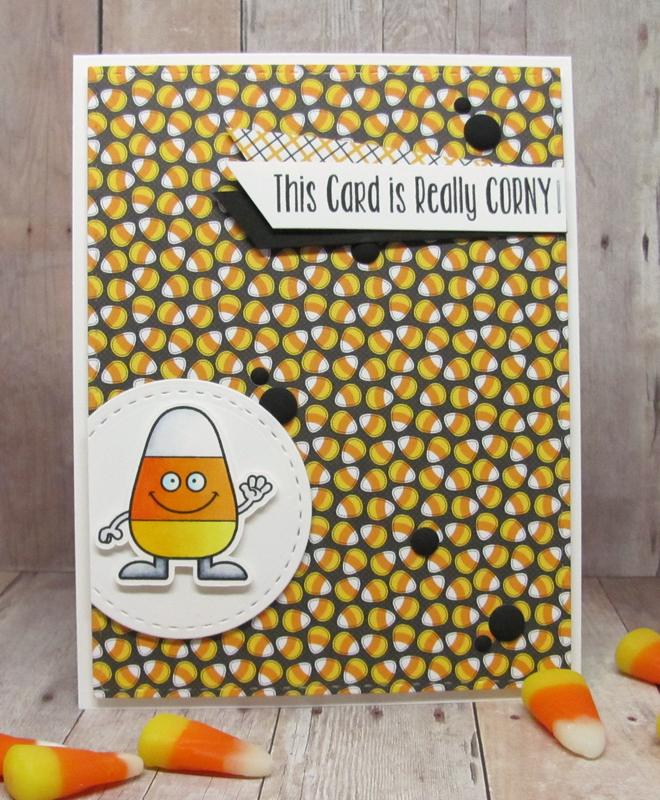 Love that cute candy corn! CANDY CORN!!! I love that stuff! And your card is just as sweet! Love it! Your cards are so cute! I especially love the candy corn one :0) Thanks so much for sharing! Cute cards. The candy corn background is perfect on the first one and I like your coloring on the Flop card. Super cute! Love that flip card! Absolutely love candy corn, so what a great card! Also, love the flop card! Something to give to someone as both a card and something that can set out to display! Great idea for the flip card! I love that candy corn! 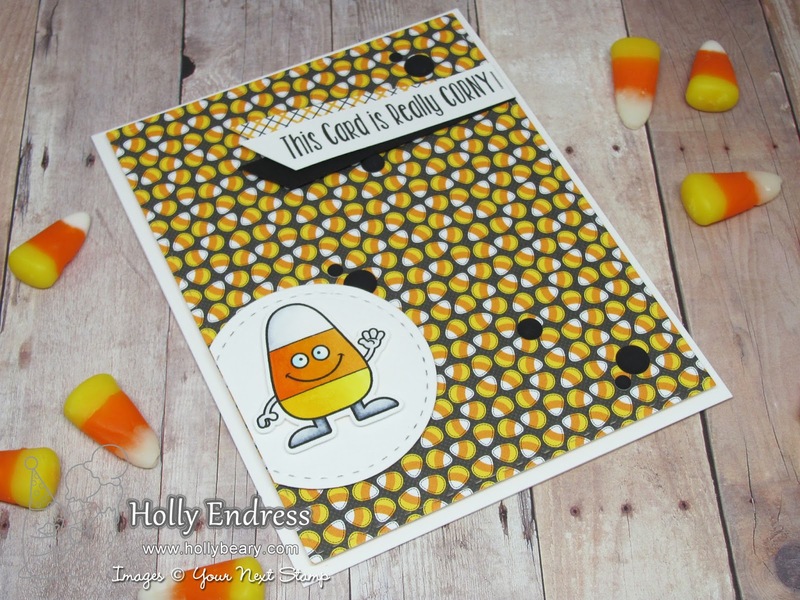 I like cute and whimsical Halloween designs and your candy corn man definitely fits that description! He's adorable! CUTE, CUTE cards - love them both! The each are just out of this world cool. Very cute cards. Thanks for sharing. OMG! I love those cards! I'm a very corny person, that be perfect for me to send out! and that squirrel flip card is very cool, must try!